Click here to download DRA's lapse plan during an appropriations hiatus. 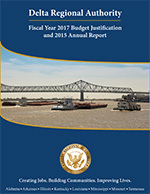 A budget justification and annual report are submitted to Congress each fiscal year to identify the expenses and investments made by the DRA through its four institutional sections: Administration & Operations; Project Development & Management; Policy Initiatives & Programs; and Communications & Public Engagement. The 2017 Year in Review, which also serves as DRA's 2016 Annual Report, highlights the programs, policy initiatives, and investments over the past year that serve as the cornerstone for DRA efforts to support job creation, build communities, and improve lives. The Delta Regional Authority is committed to accountability as we provide an effective mechanism for federal investment in the Delta region. We continually strive to improve our performance and cut waste so that our job creation and health investments have the maximum impact on the Delta. The DRA submits its processes and investments for external audit each year and is proud to have received 13 consecutive unmodified audits by an independent accounting firm. Click here to read or download the FY2018 Performance and Accountability Report. The FOIA (5 U.S.C. §552) was enacted in 1966 and provides that any person has the right to request access to Federal agency records or information, except to the extent that such records are protected from release by a FOIA exemption or exclusion. It is DRA policy to release information to the fullest extent of the law including releasing information that may be legally withheld provided there is no foreseeable harm associated with the release. This right of access is enforceable in court. In order to receive the most efficient response, all requests for records under FOIA from DRA should be submitted in writing to DRA’s Legal Counsel, Ted Connell.